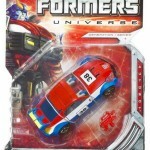 ToyArk.com has received official, high resolution images in and out of packaging for Universe Smokescreen. This figure is part of the Universe Deluxe Wave 5 (2009 Wave 2) assortment, which also introduces Dinobot. Smokescreen is due out towards the beginning of next year. Official images in and out of package for this figure can be seen by clicking the Title Bar.